Driving in Germany is different than in the USA, even though we drive on the same side of the road here and in the USA. I have been asked quite often about driving on the opposite side of the road here but that is in England and not Germany. 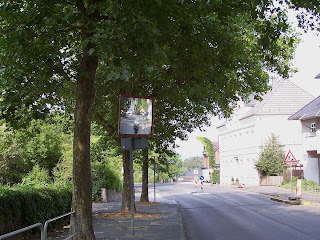 Besides the obvious difference of signs being in German and not in English there are some other things that you will find if you are driving around in Germany and one of those things are the traffic mirrors. I have a photo here of one of these mirrors to show you want they are like. To get a better view of this you can click on the picture to enlarge it. The traffic mirror is a handy thing that some smart person came up with to see around the corner in some of the tight streets here. There are some places where you cannot really see what cars might be coming your way but these mirrors are set up so that you can see the traffic on the street you are entering before you might meet them head on. In this picture you can see a mini-van that is on the street that intersects with the street in the picture. These mirrors are really helpful and I can think of a few places I have been in the states that would have benefited from having one of these!